"Ooh, when you feel the rhythm / You know you've got to give in, / So get up off your seat!" Trying mighty hard to look like Gary Cooper? Super duper! Three more episodes of this children's television favorite come to DVD, with each of these installments revolving around dancing. They're all good fun, and are likely to inspire the budding Freds and Gingers in your home. Just about everybody in the big blue house is ready for a quiet day in the second episode, Dance Fever, but Treelo has other ideas. 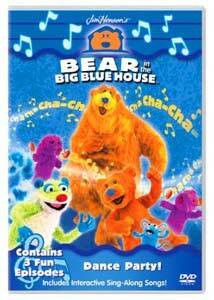 His enthusiasm is of course infectious, and when Bear decides that just a brief rest will be more than sufficient, he demonstrates that he can cut a mean rug—for what, after all, would this DVD be without the inclusion of the proverbial dancing bear? Bear has lost his cha-cha-cha in the third installment, I For-Got Rhythm!? Where could it possibly have gone? It's missing along with some prized entries in his record collection, and with the help of his friends, he tours through different kinds of music and their rhythms. It's a crash course in the beats for rap, calypso, jazz and rock, though it may be more notable for a couple of production design elements. Prominently featured are LPs and Bear's rotary phone, which are likely to be as foreign to today's preschoolers as victrolas and telegraphs. All in all, the formula is tried and true, and each of these episodes is very entertaining. It's also nice that the stories aren't overly instructive, because even if you're in pre-school, letters and numbers and everything else are fine, but sometimes, you just gotta dance. Image Transfer Review: As we've come to expect from Henson products, the technical values here are strong. Colors are nice and saturated, and though the palette is a little garish for my taste, it's full of brightness and hues likely to appeal to the target audience. Audio Transfer Review: The English-language stereo track is pretty nice and clean, with little hiss and a decided emphasis on the treble. As with the picture, it may not be as pleasing to you if the sandbox is a distant memory, but the audio more than gets the job done. And you might not think it possible, but the Spanish track is even chirpier than the English one. Extras Review: The Sing-Alongs are the most appealing extra�songs from the episodes get the full karaoke treatment, with great big colorful letters that make it easy to follow along. That and the generous helping of trailers are pretty much it for extras. Put on your dancing shoes and polish up your hokey pokey. These are entertaining, though given the high energy level, you might not want to watch these with the little people just before bedtime, for fear of revving them back up.